It is frustrating to hear people argue that the United States needs to do health care, education, social spending, etc., like Finland or other small European countries do them. A link to one such article in a recent issue of The Atlantic is at the end of this posting. 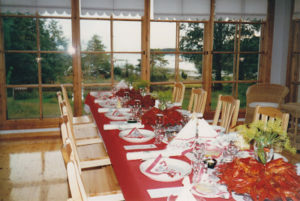 I had the privilege of taking a business trip to Finland in the late 1990’s, hosted by a Finnish gentleman with whom I served on a board of directors. It is a beautiful country, and a wonderful place for its citizens, but it bears no geographic, demographic, economic, ethnic, or cultural resemblance to the United States, and the governing strategies that work fairly well there will not work here. Finland is about the size of Montana, but the population is only about half that of New York City and, since the northern two thirds of Finland is pretty well frozen over, most Finns are huddled in the southern tip of the country trying to keep warm. They are essentially all Scandinavian, 93% Finns and 6% Swedes, and 83% are Lutheran. In the US “melting pot,” 80% are classified as “white,” which would include Finns, Swedes, Brits, French, Germans, etc. I wouldn’t be surprised if there are as many Finns in the US as in Finland. And the US is 51% Protestant and 24% Catholic with a long list of faith traditions making up the remaining 25%. Is it any wonder we have no national consensus on taxation and spending and size of government? The Finns, on the other hand, are mostly peers of each other, and there is considerable peer pressure to work hard and contribute to society. Finns tend to be lean, mean, and hard working. Obesity claims only 16% compared to 34% in the USA, and the HIV/AIDS rate is only one sixth of the USA rate. We should not be surprised that health care spending in the US is 16% of GDP compared to 12% in Finland. Finnish government spending is more than 50% of GDP compared to about 35% in the USA. Education spending is between 5% and 6% of GDP in both countries. Military spending is 2%+ in Finland and 5%+ in the US. Finland has a much higher level of social spending than the US, and an aging population is putting pressure on their system as well as ours. The Finns have agreed to work hard and pay high taxes and take good care of each other in times of trouble. That is not an agreement we will ever reach in this vast and culturally diverse nation which is tending instead to engage in class warfare. But, back to the trip I took there for some photos. We visited an island corporate retreat in the Baltic west of Helsinki and enjoyed a traditional Finnish crayfish party with lots of singing and drinking. You can read about them here. Yes, those red things on the plates are giant, succulent, crayfish. 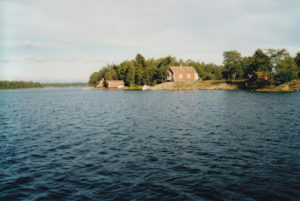 This is a view of the retreat as we were arriving by boat. We also enjoyed the traditional Finnish Sauna, alternating between sweat sessions and dunks in the very cold and clear Baltic sea. 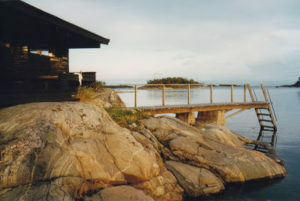 That is the charcoal fired sauna on the left and the ice cold sea with escape ladder to the right. I really wanted to go fishing. 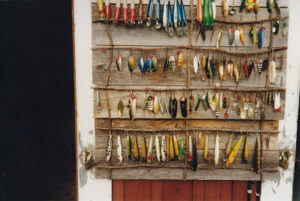 Lots of rods and lures available. I made a few casts but no strikes.